I may not wish to acknowledge it, but the fact remains. I have opportunities available to me simply because I am a member of the dominant race in my particular culture. I can always find opportunities to be in groups of people of my race. I can be fairly certain that when I need to move, I will find affordable housing in a neighborhood where I feel comfortable. I can expect that the curriculum my children will be exposed to (and that I grew up with) will largely tell stories of people of our race. I can be hired by an affirmative action employer without people accusing me of getting the job because I am white. I have been able to avoid certain uncomfortable situations simply because I am a member of the dominant race in my particular culture. I can go shopping without having people follow me (even if I wear a hoodie). If I am late to a meeting, those present will not assume it is because of my race. In addition to my white privilege, I also benefit from male privilege within my church culture. In the U.S. today, I also benefit from class privilege since I have never been in extreme poverty. Even on those occasions when my family income has fallen below the poverty line, there were always resources available to my family and me that prevented from struggling too much for too long. So I am white, male, and middle class. Whether I like it or not, whether I admit it or not, I am privileged. This does not mean I have been given everything throughout my life. I was raised by hard-working parents and I believe myself to be a hard worker. Being a person of privilege does not mean I have not worked hard. But my baseline is considerably higher than a large number of people in this country. Many people try to avoid accepting the fact they are privileged, but there is nothing value-based in making the acknowledgement; it is a fact. I must provide a voice to the voiceless. I must provide strength to the weary. I must look beyond the categories of privilege and see the other person—as a person, not a category. I must join my story with other people’s stories. My next few posts will deal with strategies to accomplish this. I do not have all the answers, so I value your input and feedback. Many of us have benefited from privilege based on our race, gender, sexual orientation, and class. Let us learn together how to use our privilege for the benefit of others. Blurred lines? I don’t think so. You’re just a chauvinist. Regardless of his weak attempts defending himself, Thicke’s Blurred Lines is the most recent in a long line of entertainment that states women are to be thought of, viewed, and used merely as sexual objects. And not only do people soak it up, but the fact that it is so demeaning is used as an object of humor (RE Jimmy Fallon’s “family-friendly” version). So the message is Thicke, and many other musicians (including female ones), can write lyrics, film videos, and hire dancers willing to bare it all in an effort to use women as a means to make a buck. But when Miley Cyrus becomes one of those dancers we collectively act like we still abide by Puritanical moral standards? Understand: I am not defending Cyrus’ actions. I am questioning why a young woman is being blasted for doing what American consumers have demanded young women do, while allowing the architect of the song and dance to get off as if he is an innocent bystander. As a father, I hope that my children never feel they need to exploit their sexuality to be considered successful. I also hope they grow up to be accountable enough to never use anyone’s sexuality as a means to an end in their quest for success. More than that, I hope we can create an environment of entertainment that does not buy and sell women’s bodies and then hide behind phrases like “artistic” and “empowering.” I hope we can create an environment where people’s intelligence, talent, and artistry are appreciated on their own merit. I hope we can create an environment where men and women are held to the same standard: an environment that calls out exploitation and abuse; an environment that does not treat victims as guilty; an environment that will not stand for degradation in any form. Because to me the lines are not blurred, they are fairly well-defined. And Miley was not crossing those lines alone. Let’s not let the other guy get away with it any more. Tonight, my brother and sister-in-law prepare for worship in the morning. Tomorrow will be a great day for them as their daughter will be baptized. Tonight is a night filled with joy. Tonight, a family with whom I have been friends since childhood prepare for worship in the morning. Tomorrow will be a sad day for them as this will be the first time they go to worship after their mother passed away. Tonight is a night filled with sorrow. Tonight, a family that has encouraged many in our home church prepares for worship in the morning. Only, they may not be present with the congregation since they will be surrounding the man who is husband, father, grandfather, and friend to so many. They surround him and wait with him in hospice care. Tonight is a night filled with unease, unknowing, and waiting. Tonight, I heard a man share his story of God working in his life this summer. He should be dead. He had a pulmonary embolism. He had renal failure. He was septic. His heart began to fill with fluid and almost strangled him from within. Yet he lives. Tonight, he was weak. He could not stand so he shared his story from a chair. But as he ended his talk, he said he wanted to pray for the family at Freedom Fellowship. This man who was so weak he could not stand and was running out of breath from talking STOOD UP and prayed a blessing over the church. Tonight, as I prepare for worship I am reminded that we all have a story to tell. When we show up to worship tomorrow, wherever that may be, we will be coming from many different places. Tonight is a night for preparation. Tomorrow will have many different expressions. Tonight is a night filled with many different emotions. Yet we will all worship the same God. Twenty years ago, I walked through these doors for the first time as a student. Fifteen years ago, I walked through these doors for the first time as a graduate student. 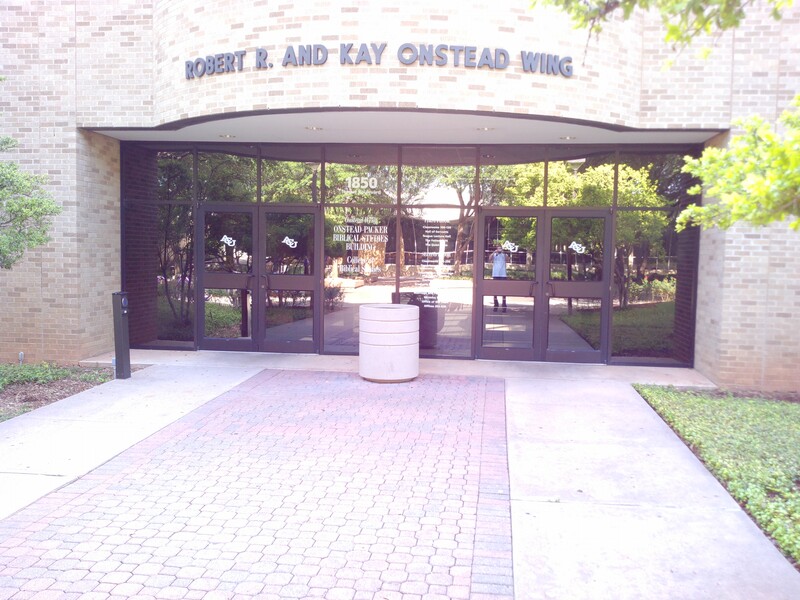 Three years ago, I walked through these doors to re-start my time as a graduate student. Today, I walked through these doors for the last time as a student. I have walked through these doors countless times. I have been changed in some way each time. When I first entered this building as a college freshman, I had no idea what my journey was going to look like. I had no idea where I would be going, what I would be doing, or what would happen along the way. There have been people who welcomed me when I walked through these doors. People like Jim Mankin, my first academic advisor. Dr. Mankin guided me through my first few years a college student. I miss him greatly. People like David Wray, John Willis, Doug Foster, and so many others who spent time with an immature, naïve, 20 year old and taught me how to think, read, and write in way I never had before. People like Tim Sensing , Mark Hamilton, and Melinda Thompson who worked with my strange, confusing, and unique degree path to make sure I could graduate. People like Jeff Childers, James Thompson, and Fred Aquino who not only taught my classes, but helped me work through my classes and deal with grief after my brother passed away. People like Jaime Goff, Sara Blakeslee, and Dale Bertram who brought out of me that small flame of giving voice to the voiceless and fanned it into an all-out blaze. People like Teri Childers, Angie Merritt, and Barbara Wilson who made sure every “i” was dotted and every “t” was crossed so that our degrees would be completed. And there so many other names that should be added to the list. Professors who were more than just teachers, they were spiritual guides: Randy Harris Jeanene Reese, Jerry Taylor, and Chris Flanders to name a few. Friends of mine who now teach and shape the current crop of college students: Houston Heflin, Brady Bryce, David Kneip, and Vic McCracken. As I walk through the halls beyond these doors I read the names on the doors and I feel a sense of gratitude for each and every person there. I may be 20 years older, but I am light years removed from that young man who walked through these doors for the first time in 1993. I will be forever grateful to the women and men who have devoted a portion of their lives to spiritually forming people like me. I love these doors. I will miss them. Yet I know others will be walking through them for the first time in just a few weeks. I pray their journeys are exactly what they need to be. And I cannot wait to see what doors God leads me to in the future. Prayer is not a Christmas wish list. Prayer is not a get-out-of-jail-free card. Prayer is not a way to shape God into our image. I do not always get what I ask for when I pray. Yet I will still pray. Because The One to whom I pray is never absent. The One to whom I pray is ever-present and ever-comforting. The One to whom I pray never leaves me alone.